6 Repertories from Jan Scholten , Kent, Boericke, BBCR, Phatak etc. Jan Scholten with his ultimate work on elements has scrutinized the unexplored remedies like Lanthanides, Hafnium or Krypton and explained its use in homeopathy. The Element Theory makes it easy for you to understand the relation between the elements in the Periodic Table and homeopathy. A different approach to perceive a case and understand deeper aspects of patient management. 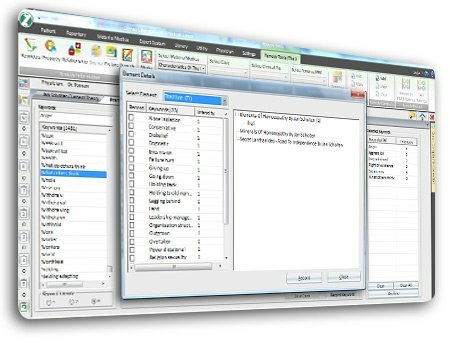 Select keywords from your case & record them swiftly at one go with the intensity and analyse them using Practical Analysis. Know appropriate stage & series of your case using Element Theory Expert System. It is now easy to enter and analyse the case history as the patient narrates using the free flow case analysis. 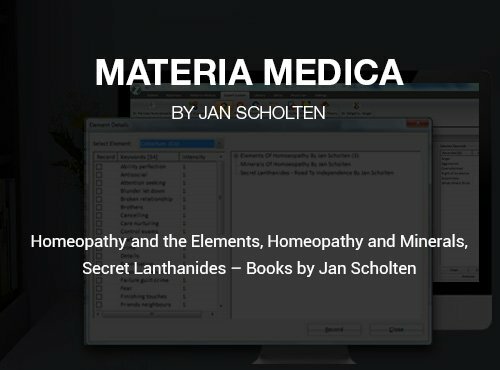 Affirm the remedy before prescribing it, right click on the element and study the entire element in detail including its Materia Medica books by Jan Scholten and Cases. 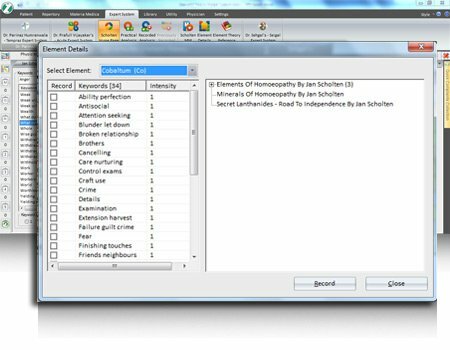 Well explained cases in a detailed manner in Hompath software, of not only the element, but also their minerals. Access a unique and visually appealing presentation of key information on stages, series and elements. Dive in the vast knowledge of periodic table. Read the materia medica, keywords, symptoms, miasms with respect to the series and various stages. It is a comprehensive way to read all the details of elements without shifting to several windows. 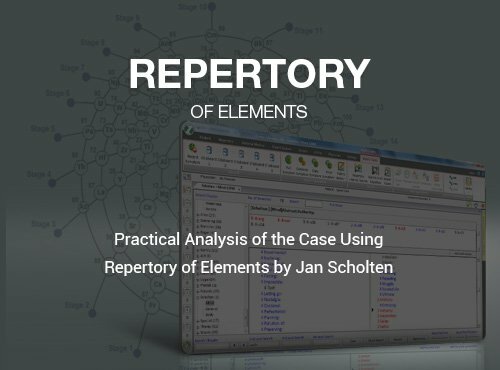 This feature of Element Theory Expert System helps you to study the keywords of all elements, stages and series and also open their Materia Medica from Jan Scholten’s books simultaneously. Packed with 25 homeopathy books including 3 books by Jan Scholten: Homeopathy and the Elements, Homeopathy and Minerals and Secret Lanthanides. It is easy to search and browse. 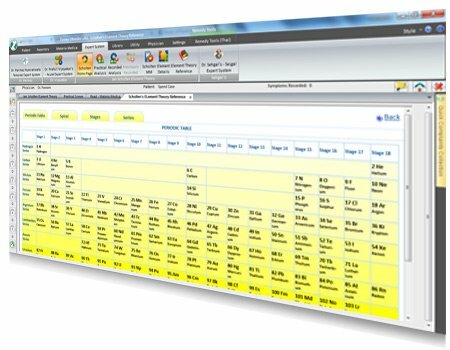 Enter a detailed case history while talking with the patient. 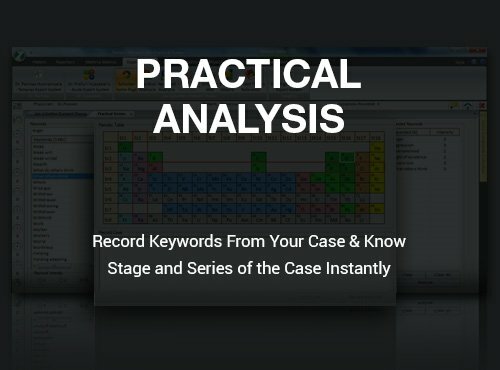 Element Theory Expert System makes it easy to record the case along with the corresponding keywords. Study the entire element in detail including its Materia Medica, cases, etc. from Practical analysis screen. Record the desired keyword and see the detailed analysis in Recorded analysis. 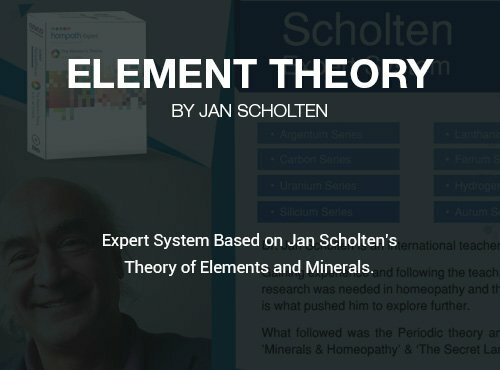 The Element Theory Expert System has collection of work by Jan Scholten in terms of his books Homeopathy and the Elements, Homeopathy and Minerals, Secret Lanthanides & Repertory of Elements. Features like Practical Analysis, Element Theory Reference, Spirals, Periodic Table, information on stages and series helps you to understand the elements and minerals better with respect to Homeopathy. 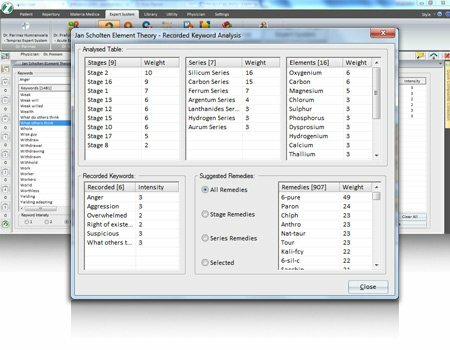 Your computer/laptop should have following basic system configurations to run Element Theory Expert System Software.